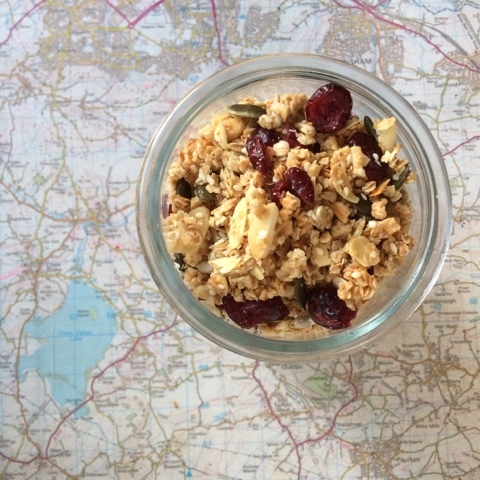 such lovely things: Mrs Rich's world famous and most delicious granola! Mrs Rich's world famous and most delicious granola! It's true, this granola is my favourite and my best and has been enjoyed by many the world over. Just about everyone who tastes it loves it (I don't think there is one person who hasn't yet) and then asks for the recipe, so I thought I would share it with you, lovely one. This is your lucky day!! It's the simplest recipe - but aren't they often the best?! Mix together the dry ingredients (but don't include the coconut or berries) in a bowl. Mix the liquids together well then add them to the dry ingredients. Give a really good stir, making sure that all the dry stuff gets covered in the syrupy mix. Then tip the mix onto a baking sheet so there is an even layer. I use two for this recipe. Place in the oven and cook for 12 minutes. Note: My oven is quite hot so you might find you need to cook yours for a little longer. Just keep an eye out that the edges aren't getting too brown. Remove from the oven and sprinkle the coconut over the part-cooked granola. Give a good stir to mix the coconut in. This also helps if some of the edges are a bit browned. You can move the granola around to achieve it cooks more evenly. Place back in the oven and cook for a further 8 minutes. When done, take out of the oven and sprinkle berries over the top. Leave to cool and then tip into an airtight jar. I always love to make granola and then I eat some for a couple of days and after that it just sits there! I have a bag in the freezer now which I made ages ago.... Maybe I need some nice yoghurt to go with it! In the past that was the same for me too, Clare, but honestly, this one doesn't last long.